Don't worry, daddy will add a link to it on my sidebar soon, but you can go over there now. 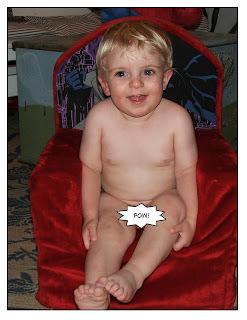 AHHHH, after a bath a little man really enjoys sitting in his man chair naked. Chillin, watching Seasame street in my big brother present- my batman chair! Test driving Gillian's mummi quilt, I approve.